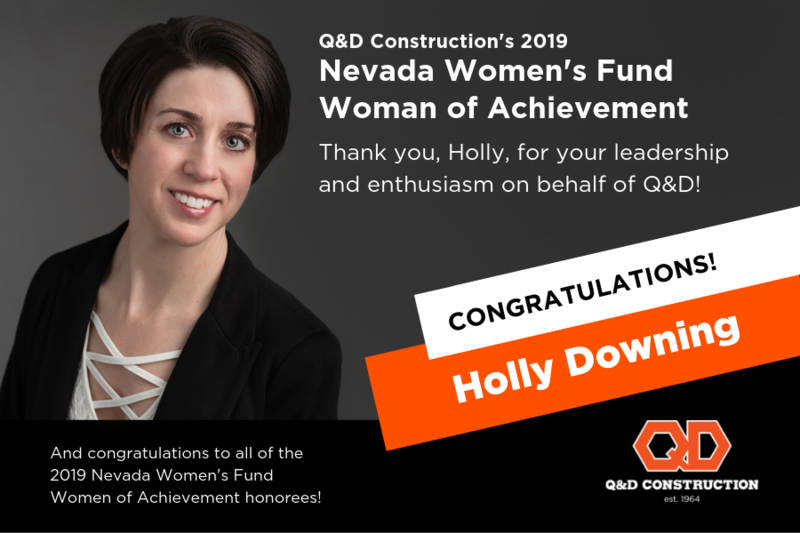 Q&D is pleased to honor A/P Supervisor Holly Downing as our honoree for the 2019 Nevada Women’s Fund Women of Achievement event. A 23-year veteran of the construction industry, Holly works hard to maintain order over thousands of invoices a week with her team of three. Since joining Q&D over six years ago, she has taken on another leadership role with the Wellness and Culture committees, encouraging employee health through activities like creating a Moms on the Run team and holding weight loss contests. Last year, Holly led the I-Dig Q&D event committee which planned and executed a “big dig” style event for over 300 employees and family members – with lunch, big equipment, play areas, bounce houses, and kids craft activities. We loved it! Thank you, Holly, for your leadership and enthusiasm on behalf of Q&D!